Tickets are expensive. 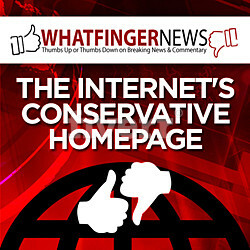 Alternatives are plentiful, convenient & cheap. The year 2018 was a banner year for the movie theater industry in the US. The number of movie tickets sold jumped 9.8% from the prior year to 1.35 billion tickets, according to movie data provider The Numbers. It was the largest jump in the number of tickets sold going back to 1996. It was a massive triumph for the industry. In terms of per-capita ticket sales: During the record year 2002, with a US population of 288 million, 5.4 tickets were sold per capita. By banner year 2018, with a population of 327 million, this had dropped 24% to 4.1 tickets per capita. This is the brick-and-mortar meltdown for the movie theater industry which is gradually losing its battle against digital competition. In terms of dollar sales, 2018 introduced a novel concept that hasn’t been tried in at least the past 22 years of the data set: No increase in the average ticket price! Maybe someone finally figured out that if you keep jacking up prices, sooner or later people will migrate even more rapidly than they’re already doing to digital alternatives. The average ticket price remained at $8.97. Depending on where people go to the movies, results may vary. For example, a typical movie at one of the AMCs in San Francisco might set you back about $14 a ticket. But there are “$5 Ticket Tuesdays” for members, and there are other discounts. In other parts of the country, movies are a much better deal. And so I can see an average ticket price across the US of $8.98 – I just can’t see it in a place like San Francisco. If a family of four goes to the movies and pays the average ticket price, it’s going to cost $36, not including the costs of transportation, terrible popcorn, and watered-down sodas. Compare this to a movie that this family can obtain digitally via numerous platforms and watch on a laptop or big-screen TV at home. By the fact that ticket sales jumped 9.8% in 2018 from the prior year, as ticket prices remained flat, ticket revenues in dollars also increased 9.8% to an all-time record of $12.1 billion. Even though the number of tickets sold in 2018 was down 15% from 2002, dollar sales were up 32%. This is because the average ticket price over the period had soared 54%, from $5.81 to $8.97. Hallelujah, inflation! In dollar terms, inflation covers up a lot of sins. 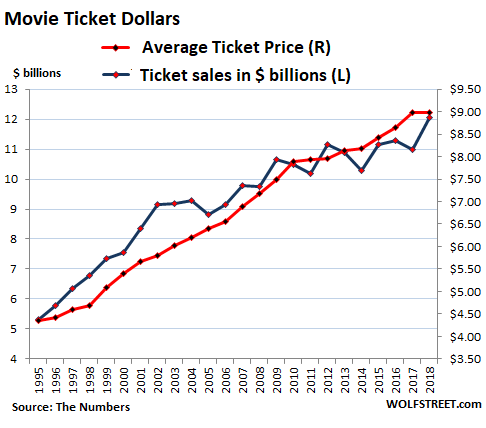 But prices that have surged at this rate since 2002 could discourage a lot of potential movie-goers, particularly with so many cheaper alternatives available at home, and this could be partially responsible for the decline in the numbers of tickets sold, and for the plunge in per-capita ticket sales. The table above shows that a company can still rake it in, as Wald Disney did, when it produces a few huge winners in a given year. People still go see movies. And in a year that has a few big winners, the whole industry looks better. In 2017, the worst year in ticket sales since 1996, but helped by much higher ticket prices, the top four movies grossed $1.82 billion. In 2018, the top four grossed 32% more: $2.4 billion – or 20% of total ticket revenues. 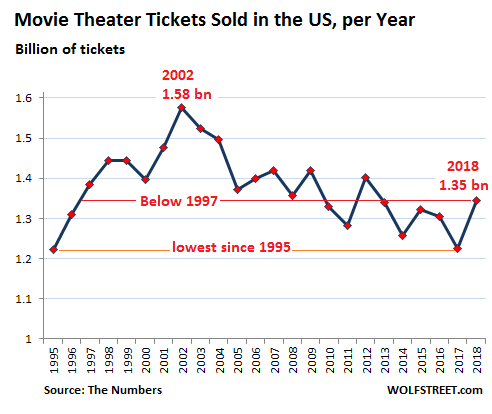 Thus, whether the industry has a good year or a lousy year depends on just a handful of flicks, even as the industry is sinking deeper into its structural decline that saw per-capital ticket sales plunge 24% since 2002.